All dogs need to keep their eyes, ears, and teeth clean and healthy so they can live longer, healthier lives just as people do. Doggy In Wonderland provides a few cleansers to help with this. To help dog owners combat ear infections happytails has created Ear Aid, a dual-action program that ..
Eyepads gently remove and prevent tearstains and cleans a grubby muzzle. 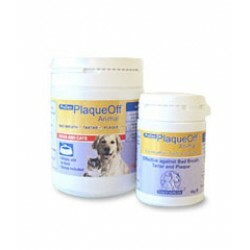 Use convenient pre-moistene..
PetzLife Oral Care is an all natural solution that will help to remove plaque and tartar from your p..
Proden Plaque Off is a 100% natural, veterinarian recommended product of Sweden for the oral health ..